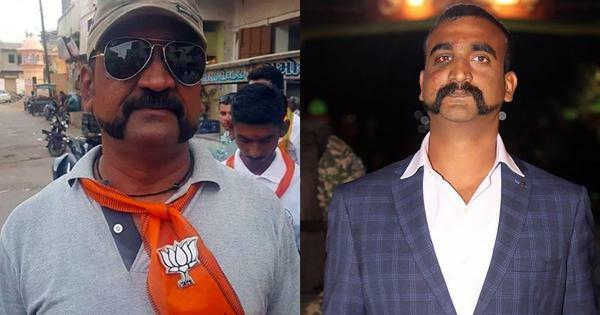 The story of how Chowkidar Govind Saroj became Bollywood actor Janhvi Kapoor. 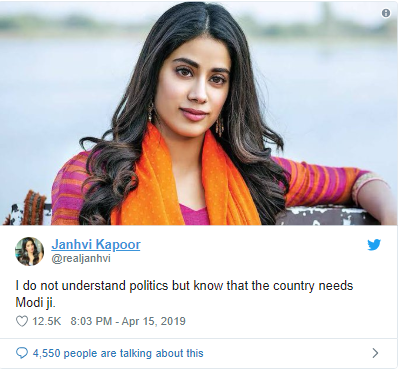 “I do not understand politics but know that the country needs Modi ji,” read a tweet from an account named “realjanhvi” at 8.03 pm. Twenty four hours later, the message had been retweeted more than 3,600 times and liked over 12,000. 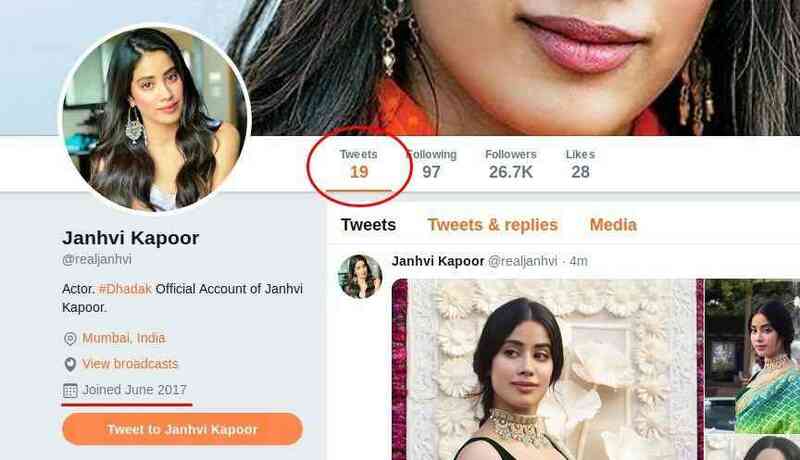 The account’s bio claims that it is the official account of Janhvi Kapoor, who acted in the 2018 Hindi film Dhadak. The handle does not have a blue tickmark, which signifies that the identity of the person running an account has not been verified by Twitter. Moreover, though the account was created in June 2017, it has tweeted only 19 times. This is atypical behaviour as actors are usually active on social media, using their accounts to promote their upcoming events and films. Every Twitter account has a unique numeric ID. Websites such as gettwitterid.com can be used to find this. In the case of the Twitter account “realjanhvi”, the numeric Twitter ID is 871660301371924481. Upon looking up this ID on Google, we came across an account called “govinddeshpremi”. 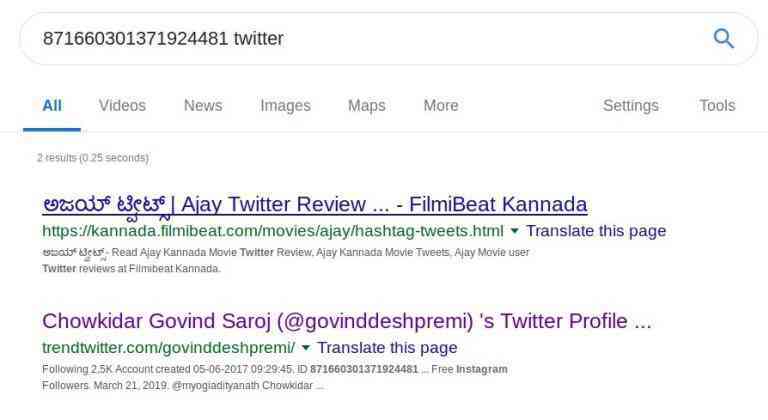 Further, on searching for old tweets where “govinddeshpremi” was tagged, and on hovering the mouse over the account username, the Twitter pop-up suggested that the account “govinddeshpremi” has been renamed to “realjanhvi”. The video below illustrates this. We were also able to locate the Google cache of “govinddeshpremi” account. We looked up the HTML source code of the page to ascertain whether it has the same numeric Twitter ID as the “realjanhvi” handle. 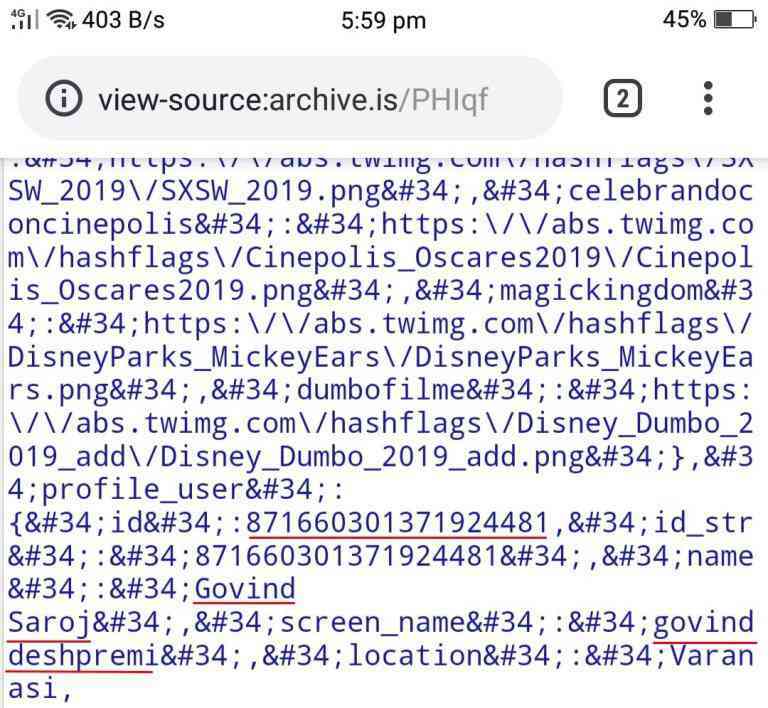 The screenshot below of a section of the source code (underlined) confirms that the two accounts indeed have the same Twitter ID, thus making it clear that “govinddeshpremi” was renamed “realjanhvi” to issue an endorsement for Prime Minister Narendra Modi. We found screenshots of the account shared by other Twitter users when it used to go by the account “govinddeshpremi”. The name associated with the account before the ID was changed to “realjanhvi” was “Chowkidar Govind Saroj”. We were also able to located Govind Saroj’s Facebook page where a similar pattern was observed: a page called Shobha Devi was merged to create this person’s Facebook page. 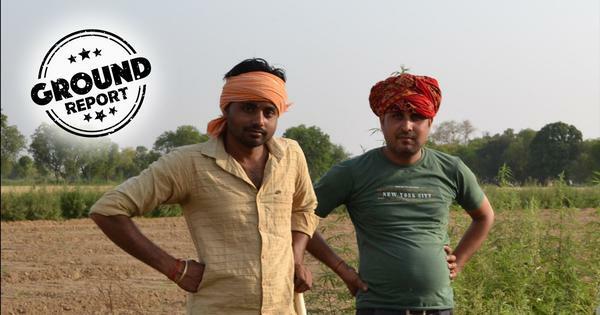 At present, Saroj uses the Twitter ID “govindnamo”. With elections in full swing, attempts to mislead voters using a variety of tactics will often be used. While unmasking all misinformation might not be feasible for social media users, they can tread carefully to look out for signs.